Due to the large number of information requests, we have posted this general page on the care of kittens. This information is for reference only, and specific questions or concerns should be directed to your local veterinarian. If you have found a cat or kittens see our pamphlet for help with who to contact. What do I do to care for newborn kittens? The kittens need to be kept warm and to nurse frequently; they should be checked every few hours to make certain that they are warm and well fed. The mother will spend most of her time with the kittens during the next few days. If the mother does not stay in the box, the kittens' temperature must be monitored. If the kittens are cold, supplemental heating should be provided. During the first four days of life, the newborns' box should be maintained at 85 to 90 degrees Fahrenheit. The temperature may gradually be decreased to 80 degrees by the seventh to tenth day, and to 72 degrees by the end of the fourth week. If the litter is large, the temperature need not be as high. As the kittens huddle together, their body heat provides additional warmth. Some cats, especially first-time mothers, are more anxious than others. Placing a sheet or cloth over most of the top of the box to obscure light and keeping the area quiet may help reduce anxiety. An enclosed box is also a solution. Anxious mothers may also attempt to move and hide their kittens - cats with this behavior should be confined in a secluded area or room if possible. What are the signs that the kittens are not doing well and what do I do? Kittens will eat or sleep 90% of the time during the first two weeks. If excessive crying occurs (especially during or after eating), the mother and entire litter should be examined by a veterinarian promptly. Newborn kittens are very susceptible to infections or they may not be getting adequate milk. When the milk supply is inadequate, supplemental feeding one to three times per day is recommended and should be done with any litter with five or more kittens. 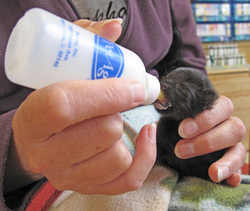 There are several commercial formulae available that are made to supply the needs of kittens, or canned goats' milk (available in many grocery stores) may be used as an alternative. The formula should be warmed to approximately 98 degrees Fahrenheit before feeding (when tested on your forearm it should be about the same temperature as your skin). If the kittens are still nursing from their mother, the recommended feeding amounts should be cut by one half to one third. Supplemental feeding may continue until the kittens are eating kitten food. Should the kittens be orphans, or if the mother cannot feed the kittens, they must have total replacement feeding using the previously mentioned products or they could die within 24 to 48 hours. Kittens less than two weeks of age should be fed every 3-4 hours. Kittens 2-4 weeks of age do well with feedings every 6-8 hours. Weaning may begin at 3-4 weeks of age. What should I expect during the kittens' first few weeks of life? For the first month of life the mother will feed and care for the kittens. They are born with their eyes closed, but they will open in 7 to 14 days. A cotton ball dampened with warm water may be used to assist opening the lids. If the eyes have not opened within 14 days of age, or if there are signs of pus or infection, they should be promptly seen by a veterinarian. Kittens should be observed for their rate of growth. They should double their birth weight in about one week. At two weeks of age, kittens should be alert and trying to stand. At three weeks, they generally try to climb out of their box. At four weeks, all of the kittens should be able to walk, run and play. How do I wean the kittens? Kittens should begin eating solid food at about 3-4 weeks of age. Initially, one of the milk replacers or cos's milk diluted 50/50 with water should be placed in a flat saucer. The kitten's noses should be gently dipped into the milk two or three times per day until they begin to lap; this usually takes 1-3 days. Next, canned kitten food should be placed in the milk until it is soggy. 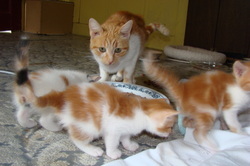 As the kittens lap the milk, they will also ingest the food. The amount of milk should be decreased daily until they are eating the canned food with little or no moisture added; this should occur by 4-6 weeks of age. Kittens should be fed dry or canned foods specially formulated for the nutritional needs of kittens. Dry foods are less expensive and can be left in a bowl for the kitten to eat at will. Kittens will eat small amounts as often as 12 times per day. Pet foods should have the AAFCO (American Association of Feed Control Officials) or the CVMA (Canadian Veterinary Medical Association) certification. This information can usually be found on the label. Milk fever...what exactly is it? Eclampsia or milk fever is a depletion of calcium from the mother due to heavy milk production. It generally occurs when the kittens are 3-5 weeks old (just before weaning) and most often to mothers with large litters. The mother has muscle spasms resulting in rigid legs, spastic movements, and heavy panting. This is an emergency situation and can be fatal in as little as 30-60 minutes - a veterinarian should be consulted immediately. Kittens should be vaccinated at about 6-8 weeks of age. If the kittens do not nurse during the first 1-3 days after birth, vaccinations should be considered earlier at about 2-4 weeks of age. Intestinal parasites or worms are common in kittens. Symptoms include general poor condition, chronic soft or bloody stools, loss of appetite, a pot-bellied appearance, loss of luster of haircoat and weight loss. Your veterinarian should be consulted regarding specific worm remedies for your kittens. What do I do if I have found feral (wild) or orphan kittens? Many wild cats give birth to kittens in the greater Victoria area. Most of these kittens are not found or seen by humans until they are 5 to 6 weeks of age. Although this age is too young for kittens to be away from their mother, our organization does believe that these kittens should be rescued by humans as soon as they are able to walk. We do this because wild mom cats will teach their kittens to be wild. If we interveen at a young age we can completely rehabilatate wild cats to live with humans. We do this because wild cats have an extremely difficult life. On average, wild cats live less than two years due to starvation, disease or accident. If you are able to rescue kittens from the wild, feed them commercial kitten milk replacer purchased at pet stores or if no stores are open, watered down canned kitten food. Never give them cows milk as it is too rich and will cause diarrhea, a serious condition in kittens. Keep them warm with towels and if possible, touch them gently and frequently to teach them that human contact is a nice thing. The kittens may need replacement feeding and/or weaning. A veterinarian should also be consulted regarding worming and vaccinations.